It’s taking me a little getting used to, but I think I’m learning quickly. Right now I have her set on scotch tension, because the double drive was pulling too much for me, and I couldn’t figure out how to adjust it. The packaging is Polish newspaper/magazine pages! My DH loved it – he can practice his Polish! It’s some Agate Colonial roving that I got from the Smoky Mountain Spinnery. I’m so happy I got Brygitta! She’s a beautiful thing! Based on my 1+ hours of spinning on her, I definitely recommend a Kromski Mazurka wheel. I’m off to spin some more! Previous postMy Wheel is on its way! 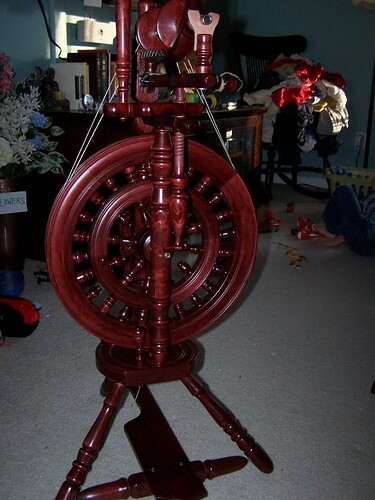 What a beautiful spinning wheel!